When you buy a new camera you’ll probably find a factory neckstrap in the box. Those aren’t very pretty most of the time, and are just long enough to hang your camera around your neck. For a short period of time that may be enough for you, but if your carry you camera around for a longer time this isn’t really comfortable. Because the weight of you camera is only supported by your neck it may be uncomfortable after some time, and because the straps are short it’s always in your way. Luckily there are some very good alternatives on the market. 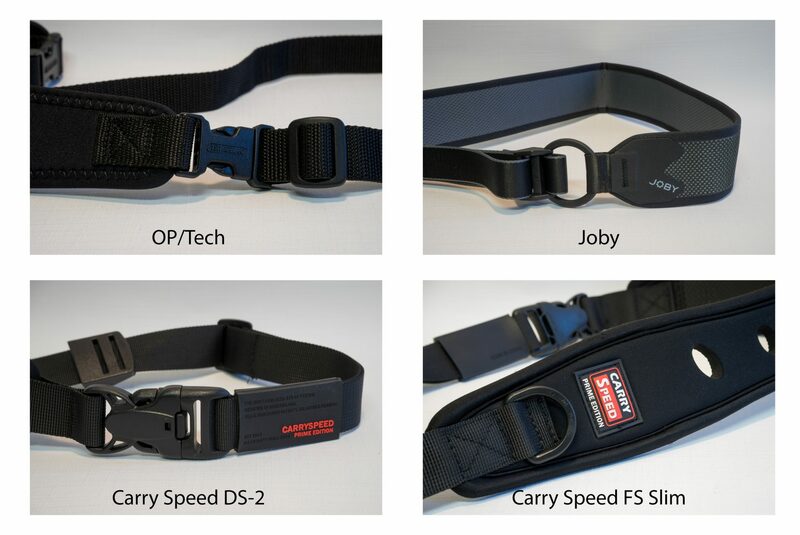 Degreef & Partner (Dutch camera accessories importer, click here to check their website) has sent me 4 alternatives for your standard factory neckstrap. All of them are slingstraps, that are long enough to hang the strap diagonally over your shoulder. By doing so these slingstraps will distribute the weight more evenly and your camera will hang on your hips so it doesn’t get in your way. A comfortable alternative for the factory strap. The OP/Tech is the least expensive strap in this review. With an recommended retail price of about 40 Euros in the Netherlands this is an acceptably priced alternative for your factory neckstrap. The strap is made of the material OP/Tech is best known for: Neoprene. This is the same material used to make diving suits. Neoprene is soft, lightweight, stretches easily and is durable. Because of the Neoprene the strap stretches to absorb shocks when you are walking. The inside of the strap is coated with an anti-slip coating that makes sure the strap won’t slip off your shoulder. The OP/Tech strap is very light weight. On one hand that is because of the light weight of the Neoprene. On the other hand it is because all the connectors and other parts are made of high quality plastics. Because of the Neoprene the strap folds easily so you can tuck it away in a bag or sidepocket. The straps is supplied with two connectors that you can use to attach the strap to your camera. Both have a quick release connector and are attached to the original strap-mounts on your camera with a small tab. OP/Tech recons you’ll only have to use one of the two connectors with most cameras. If you have a very heavy camera (for instance if you have a pro-style body like the Nikon D4) you’ll have to use both the evenly distribute the weight. Because the connectors attach to the original strap-mounts on your camera the tripod mount stays unused. That means you don’t have to detach the connectors when you want to use a tripod (you should detach the strap, but that is easily done with the quick release connectors). The OP/Tech strap excels in simplicity. Whit its fairly simple but smart design the strap is lightweight and still very comfortable. The length is easily adjusted and the connectors slide over the strap smoothly, so moving the camera to your eye from the hanging position is easy. You probably know the name Joby, it’s the brand that brought us the whacky but super smart Gorillapod mini-tripods. So it is obvious that Joby woudn’t design a dime in a dozen kind of shoulderstrap. With a price of about 50 Euros in The Netherlands this strap is a little more expensive than the OP/Tech. When you buy this strap you’ll immediately see that Joby has chosen to go a different route with this strap. There are two versions of this strap, a male and a female version. And the difference isn’t the colours or the packaging, but it is found in the design of the strap. The female version is designed to follow the female curves. There is a reason this strap is called UltraFit. When you wear this stap you’ll find it is formed to follow your bodyshape quite close (also the reason there are two versions of the strap). This means it takes some time to get to adjust to the way the strap feels, especially because it feels like the strap is too short in the beginning. If you tighten the strap to put your camera away the camera doesn’t hang on your hips like with the other straps, but it hangs on you back. This does mean it doesn’t get in your way at all, even when you are busy, and the camera is very stable. Perfect for active photographers. The Joby Strap is also very light. Joby has durable plastic parts. The shoulderpad is made of a thin, woven synthetic material with a grey and black pattern on the top. The material is very flexible. On the back of the strap you’ll find the slider to adjust the length of the strap. On the front you’ll find the attachment mechanism. This is suspended in the strap with an ingenious looking double loop that runs through the mechanism several times. That may sound complex, and it looks complex but works very easy. Because of the double loop you can shorten the strap to stabilise your camera on your back. But if you need the camera it slides smoothly across the strap so you can quickly get the camera up to your eye to take a picture. The attachment mechanism is attached to the tripod mount of your camera. If you want to use a tripod you always have to remove the strap from your camera. The screw you use to attach the strap has got a foldable tab so you can attach it to your camera without any tools. There is a slot in the screw you can use to tighten the screw further with a coin. The attachment mechanism has got a ball bearing meaning your camera can rotate 360 degrees to rotate it in to position to stabilise. 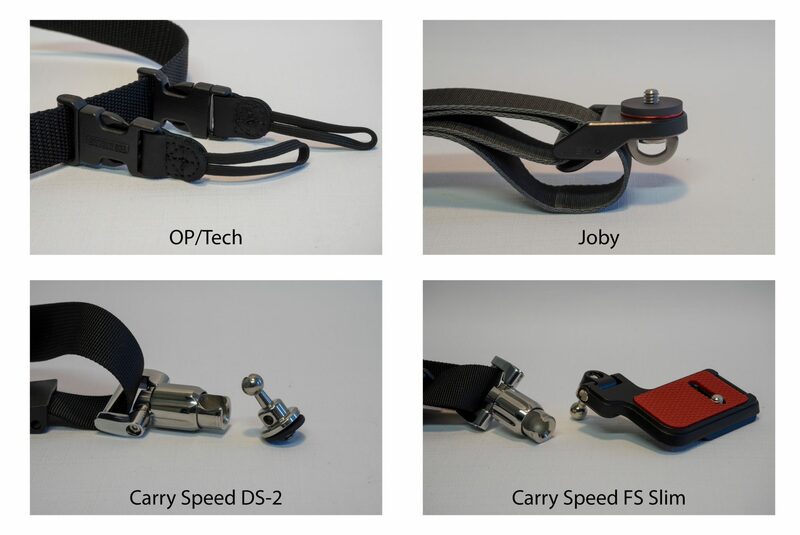 The Carry Speed straps are the most expensive ones in this review. The DS-2 Prime costs about 55 Euros and the FS-Slim is about 79 Euros in The Netherlands. The difference with the other straps is very clear when you pick them up. Instead of plastic Carry Speed has used stainless steel for the most important part of the strap, making them more durable but also heavier than the other straps. The Carry Speed DS-2 Prime is designed for smaller DSLR’s and mirrorless cameras. The FS-Slim can be used for bigger and heavier cameras or when you use bigger lenses. 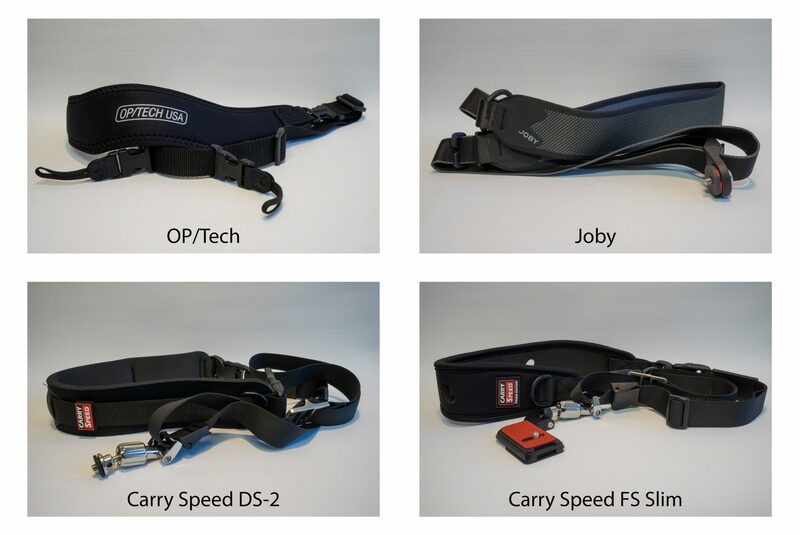 For even bigger cameras and large tele lenses you can use the bigger Carry Speed straps. The shoulder pads of both straps are made of Neoprene (the same material OP/Tech has used). The shoulder pad of the DS-2 Prime is less wide than the one of the FS-slim. The edges of the Neoprene aren’t stitched to protect them from ripping. Therefor Carry Speed has attached a safety strap over the top of the pad to protect the Neoprene from overstretching. The safety strap has got a small and subtle Carry Speed logo. Just like with the OP/Tech the Neoprene helps to absorb shocks when you walk. The strap pad of the FS-Slim is a little wider than the one on the DS-2, and has got stitching around the edges for extra durability. In the centre of the pad Carry Speed has made oval holes in the material to make it stretch more easily. Both the FS-Slim and the DS-2 have got quick release connectors to detach the shoulder pad from the rest of the strap. Carry Speed has used safety quick release connectors that need two hands to unlock them. So you don’t have to worry about shady types unlocking the connectors and stealing your gear. Both straps also have a slider to adjust the total length of the strap. The most important part of both straps is the big stainless steel quick release buckle to attach your camera to the strap. The quick release buckle attaches to a ballhead on the mounting plate. The connector has got a spring loaded head to attach to the ballhead. You have to pull the head up and simultaneously turn it to open it. It takes some practise to open the connector with one hand, but after a few tries it opens easily. 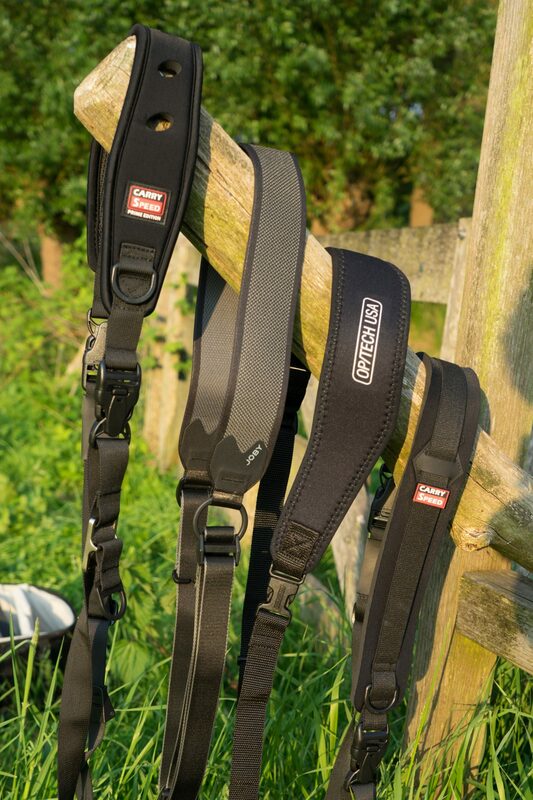 All Carry Speed straps use the same ballhead so you can easily switch between different models, which can come in handy if you have more straps. Because the connector is based on a ballhead your camera can rotate 360 degrees when it is attached, making it easy to find a good position to carry your camera comfortably. The stainless steel connector slides over the strap with ease to move it to your eye. When you have attached your camera to the strap you can tighten the strap to the desired length with just one hand use a big metal slider. The slider has got a big plastic ring you can hook your finger in, so you can adjust the length fast and easy. If you don’t need your camera just leave it hanging and pull the slider to put the strap in ‘transport mode’. If you pull the strap tight the camera hangs on your hip, stabile and comfortable. If you want to take a photo you can just grab your camera and slide it over the strap to get it to your eye. The metal slider you used to secure the camera in ‘transport mode’ slides up almost without any resistance if you need your camera, so you don’t have to unlock it to take a photo. Besides the difference in the width of the shoulder pads there is a big difference between the attachment plates of both models. The DS-2 Prime has got a small ballhead with a screw-thread that screws in to the tripod mount of your camera. The ballhead has got a small rubber gasket to protect your camera from scratches. There is a small hole in the ballhead you can put a pen through to extra tighten the ballhead. Because of the small size this attachment method is perfect for smaller and lighter cameras. The FS-Slim has got a bigger attachment plate, that also has a big rubber plate to protect your camera from scratches. You mount the attachment plate to the camera with a screw using the supplied allen key, but the screw also has a slot to tighten it with a coin. There are 6 (!) standard size tripod mount screwholes in the bottom of the plate, so you can attach the camera to a tripod with the plate mounted. Besides that there is a Arca Swiss-style mount on the bottom, so you canals use it with a tripod with quick mount. The ballhead is located to the front of your camera on the left side of your lens. The ballhead can move 90 degrees horizontal or vertical. So it can adjust to about any mounting situation. At first I thought that the mounting plate of the FS-Slim would be too big for my small Sony A7 camera, so I started using the smaller DS-2 Prime. My A7 with the kitlens attached is quite big for a mirrorless camera, because of that the A7 wasn’t very stable while walking around with the DS-2. Eventually I switched out the smaller mount for the bigger one of the FS-Slim, which works better with my big mirrorless camera. If you have a smaller mirrorless camera with a smaller lens (like the A6000 or Nikon 1 V3) you’ll probably be better off with the DS-2 Prime. I’ve tested all straps with my Sony A7. Each of them gives you way more comfort than the original nekstrap I got with my camera. The OP/Tech stands out because of the simple design and light weight. With the relatively low price this is a good no-nonsense alternative for your factory strap. The Joby took me some extra time to get used to. Because of the design the camera hangs on your back instead of at your hip. Because of this it is very stable and can even be used when you are an active photographer. The Joby will appeal to the sporty photographer who wants to take his camera hiking or with other activities. I noticed I used the Carry Speed straps the most during my review period. With the way I use my camera these provided most comfort. Because of the real stainless metal parts these also look a little more luxurious while the others are sportier. If you have a small mirrorless camera I’d suggest the DS-2 Prime. For the bigger cameras the FS-Slim will be an better fit.